This will obviously vary depending on where you are staying. As my hypothetical start point, I’ve chosen the Pop Century resort (located in the Animal Kingdom resort area). For the travel times, I chose a midpoint of the times offered on the travel route calculator at OurLaughingPlace.com. You can make your own guide based on where you’re staying or whether you have access to a car or taxi. 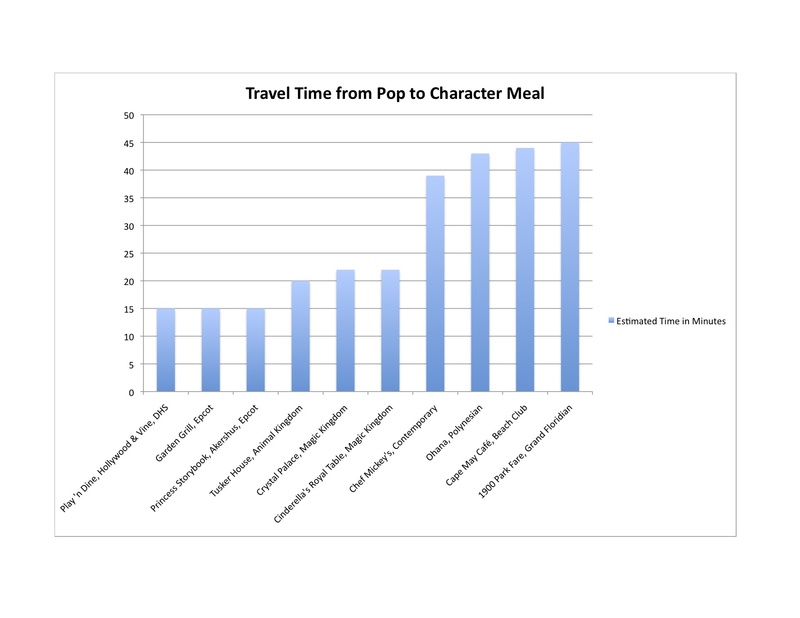 A quick glance shows that when using Disney transport, it takes significantly less time to travel from the Pop to any of the meals located in-park rather than to those in the resorts. This will be true for most Disney Resorts, as traveling from resort to resort often means switching buses or boats on the way, whereas all Disney Resorts have direct bus, boat, or monorail routes to the theme parks.